I’m sure you all have had pretty busy weekends already and likely will not be sitting at a computer today, but if you find yourself with a few minutes on your phone or iPad you can’t miss all of the 4th of July sales! The first one you need to check out is the Tuckernuck 4th of July Sale – they’re giving you 20% off site wide when you spend $200 or more until Wednesday! Just enter code HBDUSA at checkout! 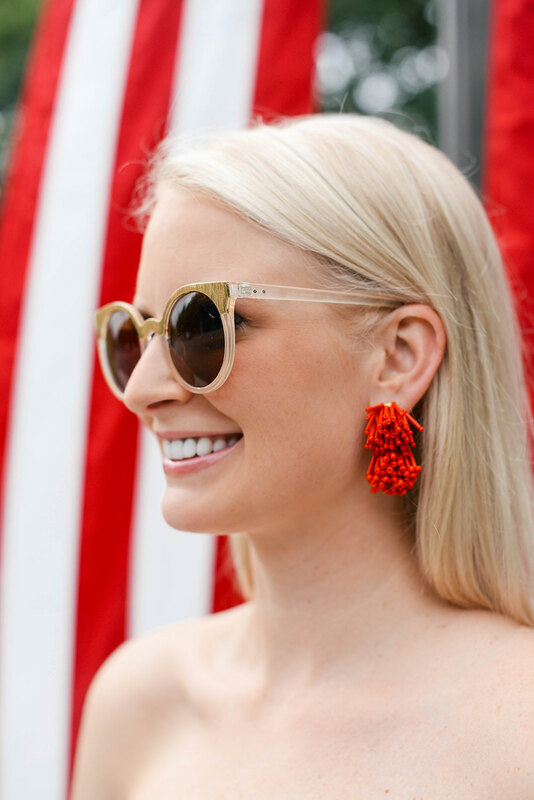 This tiered stripe dress and these fireworks earrings (already under $90!) are my two favorite picks on the site right now, but below is a roundup of fab new arrivals and staple faves to give you inspiration as you shop the sale. Don’t wait – the good stuff goes fast! They just came out with the earrings I’m wearing above in gold, gunmetal and silver. Any pair would be such great party accents this fall! If you’re looking for a few inexpensive summer staples to wear through the rest of the season, try this simple straw clutch, this white one-shoulder top and this effortless off-shoulder number. While I love the dress version I’m wearing above, there’s also a top style that would look adorable with white denim! This nautical weekender would be a great gift for the frequent traveler. I’ve been dying to get my hands on a pair of these knotted heels, and now that there’s a sale there’s no better time! I would love to add a sarong like this to my beachwear collection – so flattering and versatile! A girl can never have too many striped tees. This one is a keeper! I wish I’d seen this embroidered tunic last week – would’ve been perfect for this weekend! But wait, there’s more! Here’s a round up of the other big sales happening this weekend. Happy shopping! 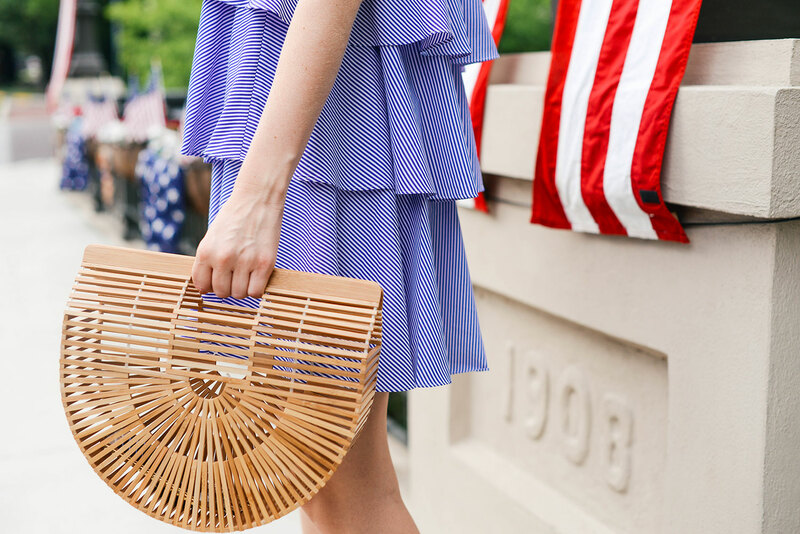 Rebecca Taylor // Enjoy an extra 40% off all sale items with code JULYSURPRISE! One Kings Lane // Shop the Summer Blowout Sale and save up to 75% on everything from furniture to accents. Neiman Marcus // Last Call has begun at Neiman’s, which means you can get up to 70% off regular prices! SHOPBOP // Hundreds of new markdowns have hit the sale section you won’t want to miss! Serena & Lily // Everything is 20% off site wide with promo code HAPPY4th! Trina Turk // Enjoy an addition 25% off all sale merchandise! That dress is so cute!! Love the tiered style! You look so cute and patriotic!! Love the entire look. So perfect for the 4th! Love, love, love this! So perfect for summer!